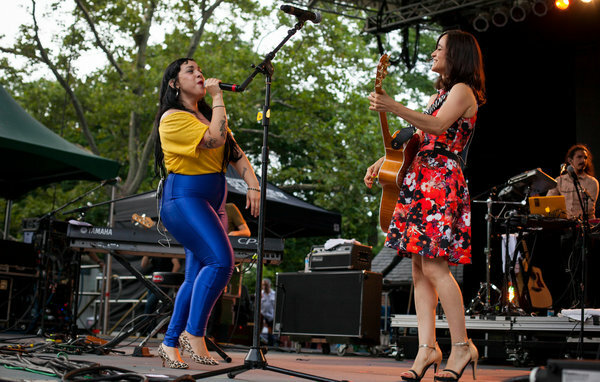 Women from Mexico reigned at the 14th annual Latin Alternative Music Conference: five days of showcases across three boroughs, including free concerts at Central Park SummerStage and Celebrate Brooklyn! Lila Downs, a songwriter who fuses Mexican and pan-American folklore with a streak of social consciousness, performed at SummerStage on Thursday, and Julieta Venegas and Carla Morrison, both songwriters whose affectionate pop is tinged with philosophical reflections, performed there on Saturday. All three are Latin Grammy winners. Their songs radiated optimism, sensual pleasure, collaborative spirit, memories of tradition and an underlying determination: exactly what Latin alternative music is counting on as it patiently makes inroads in the United States. But the larger purpose of the conference was simply getting the music heard. It provided a free compilation albumonline and set up club showcases for bands from Peru, Venezuela, Chile, Argentina, Uruguay and Puerto Rico. The conference stretched itself this year: expanding uptown, adding spoken-word performances and music-related films to its schedule and drawing connections to the Latin tributaries of New York funk and hip-hop. The conference offerings began and ended at Crotona Park in the Bronx, with the Brooklyn rapper Joell Ortiz — a close, wry observer of urban poverty — and the Chilean disc-jockey team DJ Raff vs. DJ Bitman on Tuesday, and a Bronx funk band founded in the 1960s, the Ghetto Brothers, on Saturday night. Throughout the conference, the Latin American performers brought music that looked both homeward and outward. Ms. Downs’s songs were driven by Mexican rhythms like cumbia and son jarocho, and she showed off some traditional-style steps. Meanwhile, the video screen behind her overflowed with rapidfire images, and she brought onstage another crosscultural dynamo: the singer Angélique Kidjo, from Benin. Another Mexican songwriter, Natalia LaFourcade, topped a superb five-band showcase at the Gramercy Theater on Thursday night. Her most recent album is “Mujer Divina,” a collection of songs by Agustín Lara, the revered Mexican songwriter who made his reputation in the 1930’s, and her set had a genially retro tone, with knowing hints of 1950’s pop. Ms. LaFourcade also sang with the band La Vida Boheme, from Venezuela, whose new album, “Será,” broadens and deepens its music past its earlier propulsive dance-rock, picking up hints of African and Caribbean music and bringing new introspection to its lyrics while still hitting hard. The Gramercy lineup also included Bareto, a Peruvian band whose lilting electric cumbias reminded this American listener of Los Lobos, and Astro, from Chile, which released its debut album last year; its keyboards, programmed beats, a robust rhythm section and utopian lyrics added up to euphoric songs. The conference gave a New York City audience the rare chance to see long-running bands like La Vela Puerca, founded in 1995 in Uruguay, which played pugnacious punk and ska at the Mercury Lounge on Wednesday night, and Catupecu Machu, formed in 1994 in Argentina, whose arena-scaled hard-rock carried darkly poetic lyrics when it performed at the Gramercy Theater. There were also return conference visitors like the groups that performed in the rain to a diehard audience at Celebrate Brooklyn! on Friday night: Mexican Institute of Sound, a disc jockey and a rhythm section who jokingly mesh cumbia with electropop and surf-rock; and Nortec Collective Presents Bostich + Fussible, the Tijuana group that puts ominous electronic pulses behind the oom-pah of norteño music; Bostich and Fussible, the programmers, were joined by sousaphone, accordion and guitar. Most of the performers at the conference let the sound of their music send their message of cultural connection and pan-American interaction. But rappers made it explicit at SummerStage on Wednesday afternoon, where Cuarto Poder, from Venezuela, and Los Rakas, a Panamanian hip-hop group now living in Oakland, Calif., opened for the Brooklyn rapper Fat Joe. The four rappers of Cuarto Poder paid homage to New York City hip-hop by bringing along a dizzying break dancer. As their music switched among hip-hop, reggaetón and dancehall beats, their fast rhymes proclaimed solidarity across the hemisphere.